The show was great for drummers this year with a host of new kits, cymbals and hardware for our delectation and most of the major companies have been very busy. Roland and Yamaha both pulled out the big guns with new electronic kits. Roland is replacing the TD-6 with the TD-9, while Yamaha launched its new flagship electronic kit the DTXtreme III, combining sturdy hardware with great sounds, including samples from their oak, maple, birch and beech Custom Absolute acoustic drum ranges. Yamaha also unveiled the stunning PHX kit which comprises a centre-ply of Jatoba and four plies either side of Kapur, both of which have never been used in drum construction before, plus a maple or ash outer ply. Yamaha say that using the hardest wood in the middle surrounded by softer plies produces a sonic ripple effect similar to the sound a pebble creates when dropped in water. Curious. Although Pearl launched the Vision kit at last year's NAMM it was a fairly low-key launch from a UK perspective. This year sees the introduction of the VBX and VMX ranges featuring 100 percent birch and 100 percent maple shells respectively. Both kits boast nine configurations and five high-gloss lacquer finishes including Black Ice. Killer finishes were order of the day with Pearl and DW, amongst others, serving up tasty hot-rod style designs. Black on black hardware also looks set to be the big trend for '08. 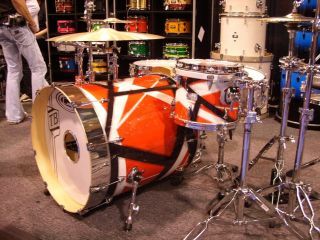 We were also taken by Orange County's custom paint job on Travis Barker's new three-piece based on Eddie Van Halen's legendary Frankenstein guitar. Sonor are helping Steve Smith celebrate 30 years as a Sonor endorsee with a Signature kit. All shells are hand made from Beech with an outer veneer of Birdseye amber. The sizes are 20"x16" bass, 8"x8", 10"x8" and 12"x8" toms, 14"x14" and 16"x16" floor toms", 12"x5" snare drum plus a 14"x5½" 3mm cast steel snare. The package also comes with a portable audio/video Player, stacked with an array of Steve-related media. Also on the signature front was the Tama Stewart Copeland Signature Kit which you may have seen on the band's '07 world tour. Tama will be producing 30 replica kits in 'Police Blue Sparkle' finish consisting of 22"x18" bass drum, 10"x8", 12"x8" and 13"x9" toms, 16"x16" and 18"x16" floor toms, 14"x5" Signature snare, four Octobans, 20"x14" gong bass and 8"x4" and 10"x4½" tymp toms. Over at DW, aside from the impressive one-off kit covered in 160,000 Swarovski crystals - sunglasses essential - their latest construction innovation was the X-shell which involves cross laminating the plies at a 45 degree angle resulting in a lower pitch whilst retaining the strength of horizontal ply shells. They were also showing off their new 23" bass drum. Hardware wise, standouts included lightweight, flush-based hardware from both DW and Pearl for ease of transport, an affordable version of the Pro 1-V pedal from Trick and the return of an old classic from Sleishman with their unique take on the double pedal. In response to the sonic demands of rock music Sabian has conjured a new high-decibel cymbal range designed to cut through a thick wall of noise, called APX. The full arsenal including ride, splash, crash, hats, Chinese and two O-Zone crashes. Mb8s are Meinl's new entry/mid-level cymbal aimed at the young rocker stepping away from their first budget cymbal set. Zildjian and Paiste have added more options to their K and Twenty ranges respectively. The stars were out in force and Rhythm had the pleasure of catching up with old friends including Ronnie Vannucci (The Killers), Daniel Adair (Nickelback) and Joey Castillo (Queens Of The Stone Age). As always, you can read reviews of all the latest gear in Rhythm every month.